North Korea today announced the death of supreme leader Kim Jong Il and asked its people to rally behind his young son and heir-apparent, while the world watched for signs of instability in a nation pursuing nuclear weapons. North Korean leader Kim Jong-Il (left) who died on Monday and his youngest son Kim Jong-Un, who was named by the official news agency as the "great successor" to his father. London/Washington, December 19 The US and Western leaders, caught by surprise by the announcement of the sudden death of Kim Jong-Il, have said the takeover by his son could be a “turning point” for the isolated nation to reengage with the international community. Israel has released hundreds of Palestinian prisoners, the second and final phase of a swap with Gaza Hamas militants that brought home an Israeli soldier after five years in captivity. The British government will axe more than 700 top-ranking military officials, including rear admirals, major generals and air vice-marshals, in the next three years, a media report said, citing a leaked document. Defying all speculations, often spurious and vicious, President Asif Zardari returned to Karachi late Sunday night. For two weeks, the nation remained on edge amid wide perception of escalating institutional clash and dark predictions of extra-constitutional intervention. BACK HOME: Pakistan’s President Asif Ali Zardari at his residence in Karachi on Monday. South Korea launched a high alert for its military as it faces the North’s 1.2 million-strong armed forces, while President Barack Obama and South Korean President Lee Myung- bak agreed by phone to closely monitor the events and cooperate. People on the streets of the North Korean capital, Pyongyang, broke into tears as they learned the news that their “Dear Leader” had died at the age 69 of heart failure Saturday while carrying out official duties on a train trip. While there was no immediate statement on official succession, there were clear indications that Kim’s 20-something son, Kim Jong-Un, would be in charge. The North said in a dispatch that the people and the military “have pledged to uphold the leadership of comrade Kim Jong-Un” and called him a “great successor” of the country’s revolutionary philosophy of juche, or self-reliance. 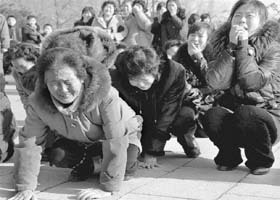 South Koreans expressed concern over the news. But an analyst said Kim’s death was unlikely to plunge the country into chaos because it already was preparing for a transition. The US and Western leaders, caught by surprise by the announcement of the sudden death of Kim Jong-Il, have said the takeover by his son could be a “turning point” for the isolated nation to reengage with the international community. “This could be a turning point for North Korea,” British Foreign Secretary William Hague said as he urged the new leader to recognise that engagement with the international community offers the best prospect for his nation, BBC reported. Also sounding warily optimist, the French Foreign Minister Alan Juppe hoped that the new leadership would bring in “new freedom” for North Korea. But US leaders watched the developments unfolding in a nation pursuing nuclear weapons with caution, as the White House said that President Barack Obama has been informed of the developments. In a statement, the White House said it was “closely monitoring” the situation in a nation with a history of belligerence. Under the Egypt-brokered deal, Israel agreed to exchange a total of 1,027 prisoners for Sergent Gilad Schalit, who was captured by Gaza militants in June 2006. 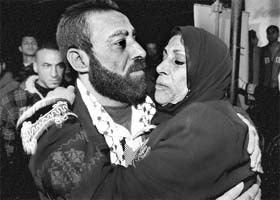 Schalit returned home in October when Israel freed the first batch of 477 prisoners. Yesterday’s release of 550 prisoners completed the swap, the most lopsided in Israel’s history. The release last night was not infused with the same drama as the first phase, since the most significant players in the trade had already been freed. The October 18 return of Schalit, who appeared pale and thin but otherwise healthy, was the first public sighting of him since his capture, and the plight of the young man had captured Israel’s attention for years. While at least 700 high-ranking officers and civil servants of the UK’s Ministry of Defence would lose their jobs by 2014, another 335 will be axed before 2020, as the Ministry of Defence (MoD) has become “top heavy”, The Guardian quoted the confidential document as saying. The cuts detailed in the document, which was sent to senior officials last month, is part of a review by Jonathan Slater, the MoD director-general of transformation and strategy, the newspaper said. The President’s return should quash most of these but the Prime Minister is still talking about the unspecified conspiracies to thwart PPP’s impending triumph in Senate elections. Gilani, however, has now tried to dispel perception about the stand-off among institutions and emphasised that the military and the judiciary firmly stand behind democratic order. 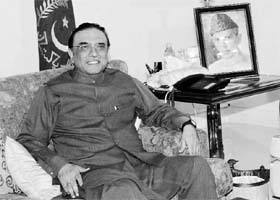 Much will also depend on how President Zardari would conduct himself in coming days. His planned address to joint session of Parliament may have been deferred indefinitely. It was announced when he had aggressively responded to perceived conspiracies by the military and the judiciary. But he certainly would make first public appearance on December 27 at Noadero to mark the death anniversary of his slain wife.